Cartmel is a village, just outside the Lake District National Park, near the coast and within the Lower Allithwaite civil parish in South Lakeland district of the English county of Cumbria. 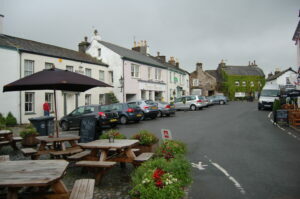 It is a village steeped in history and importance, having served as a gateway to the west of Cumbria for many centuries when before the railways in particular, visitors and commerce was carried out on carriages drawn across the sands of Morecambe Bay. Today the village has some 300 permanent residents but is a well established tourist destination for the many attractions it has to offer. 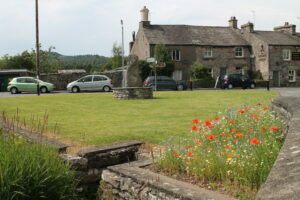 You may find out much more about Cartmel and what it has to offer today’s visitor by visiting The Village website. The development of the village was greatly assisted by the establishment of the Priory, an edifice of magnitude not often seen outside large towns and cities in the 12th century. The Priory is a major pole of attraction to this day. Visit their website for information on its history, services and events. 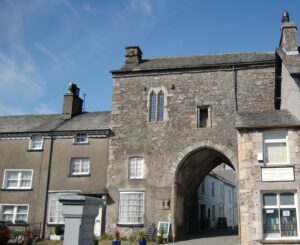 Along with the church, the Grade II listed and National Trust owned gatehouse is all that remains of the Augustinian Cartmel Priory. The priory was founded in 1190 whereas the gatehouse was built about 1330. The gatehouse is described by English Heritage as an excellent example of a medieval monastic gatehouse. The Cartmel Racecourse, although small, often has the third highest average attendance of any jumps track in Britain after Aintree and Cheltenham, the largest crowds can be just over 20,000 on one day. It is the venue of nine annual race fixtures, the Cartmel Agricultural Show and hosts a number of other events and more recently music concerts. Simply Red and Jules Holland were two of the acts appearing in the Summer of 2016. For information on events taking place on the Racecourse visit their website. Cartmel being the home of the renowned Sticky Toffee Pudding and with the establishment in the village of successful eateries by Simon Rogan, including his two Michelin star L’Enclume and its award winning pubs, cafe and shops is a very popular tourist destination with over 200,000 visitors annually.